My first choice: Passion Fruit Raspberry. But then, I will almost always choose the passion fruit flavor of anything. If there was a passion fruit flavored cheese, I'd be there. 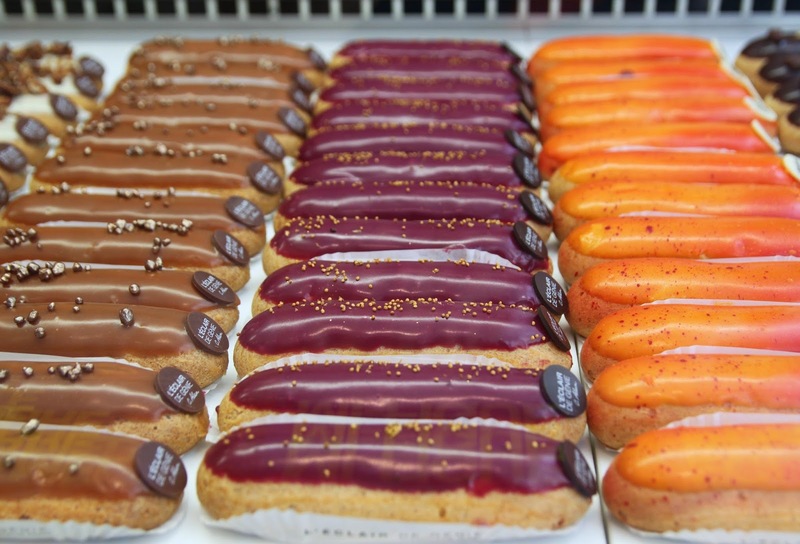 At l'Éclair de Génie , each one is a small affair of around 5" (12cm) long and comes in at around 4.5 - 6.5€ per éclair. That's a bit of a problem in that I'd love to try them all (A Month in Eclairs?). 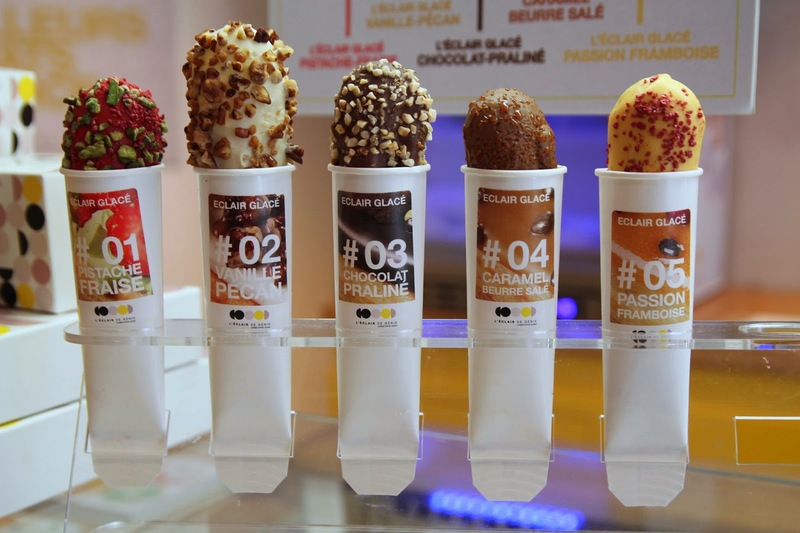 The most expensive ones are the ice cream versions. Yeah: ice cream éclairs. It's genius. They sell truffles and spreads and other goodies, too. But seriously, let's get back to the éclairs. Yes, they are not the only ones to venture out of the chocolate/cream/coffee trilogy. Even my local La Parisienne sometimes offer pistachio or vanilla éclairs. And high-end bakeries like Fauchon also sometimes offer caramel or one or two original varieties. 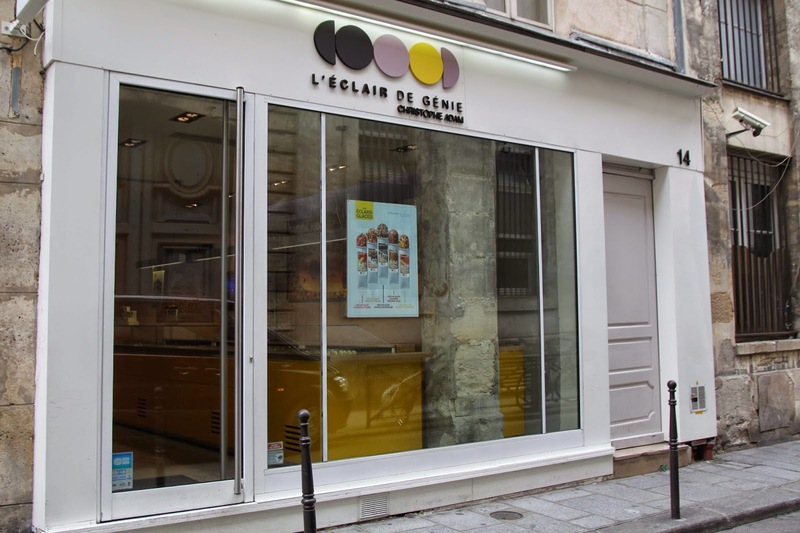 But what makes Éclair de Génie so special is that they offer pretty much nothing but creative éclairs. Founder and pastry chef Christophe Adam has outdone himself. Among many, many others, flavors you'll find lemon-yuzu, apricot, and one that includes Jivara whipped cream (no, I don't know what that means), mango-passion-fruit purée, and lime zest. Even a classic éclair wasn't always an éclair. Before the term was first known to have been used, traced by the Oxford English Dictionary to 1861, the treat was called a "pain à la duchesse" or "petite duchesse" and it was believed to have been invented by either Marie-Antoine and/or Antonin Carême, pastry chef(s) to French royalty, in the earlier part of the 19th century. A bit about the etymology: "éclair" actually means lightning. There's some difference in opinion about why this treat is named after lightning. Some say it's because the pastry will be eaten so quickly, like a flash of lightning. The Chambers English Dictionary even defines an éclair as “a cake, long in shape but short in duration.” More believably, however, it's named after the shininess of the glaze. And "génie" translates as "genius" and "wizardry" and in this case, well, I think both words are fitting here. By the way, an éclair is made with pastry dough (the same used for profiteroles, gougères, and cream puffs) then filled with pastry cream. Those things you're buying in the US (I'm talking to you, Mom and Dad) that are made with a bready-donut pastry and filled with pudding, those are not éclairs. Technically, they are Long Johns that are misleadingly labeled. And they are not good. 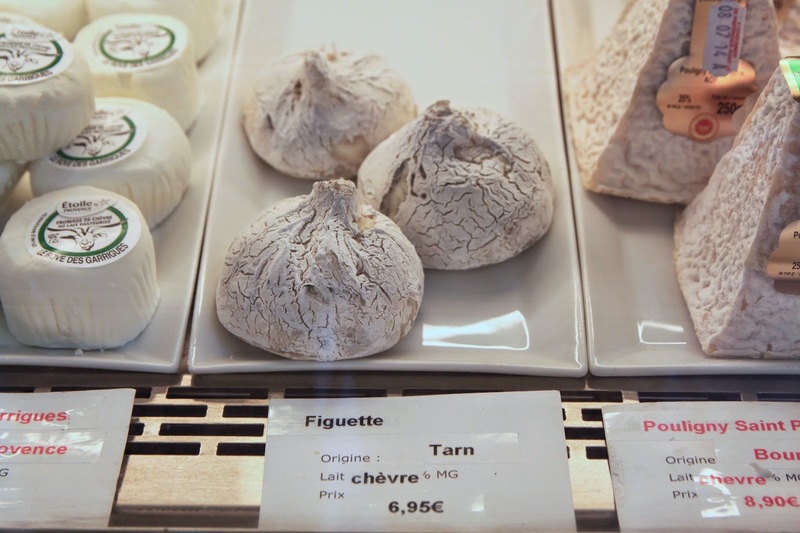 The Figuette is a farmhouse cheese made from raw goats' milk. The farmer who makes this only has a small herd of 60 goats in the small town of Mauzac (near Toulouse, in Tarn), so perhaps it's no wonder that it's a small cheese. It's exactly the same size, shape, and color as a Chinese dumpling. Having written that, of course I realize I should say it's the same size and shape as a fig, after which it is named. But damn that looks like a Chinese dumpling! It's made by twisting the cheese by hand in a strip of fabric (and I'd say "rag" but that makes it sound like they use a dirty old rag, which they obviously do not). It's a lactic cheese and can come in plain, or covered with paprika, cumin, ashed, herbes de Provence. But the inside is the same no matter what it's covered with: creamy, thick, and with a lovely salty-milky goat flavor. The inside has delicate veins of ash, which make it quite striking. It tastes nothing like a Chinese dumpling, or a fig, for that matter, but it's just as delicious as either in its own way. 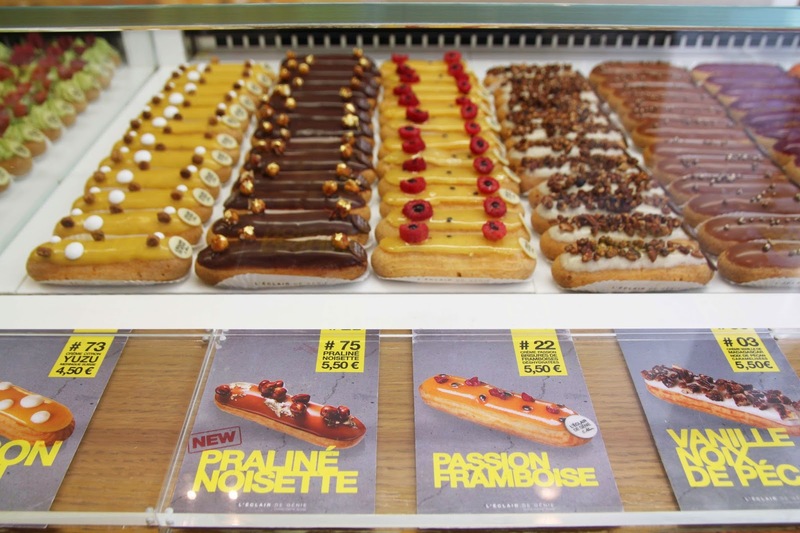 Fig (figue) is just one of the many original éclair flavors offered at Éclair de Genie. Actually, the flavor is Half-Fig, but the other half is Half-Fig. It's the Half-Fig Half-Fig flavor éclair. By coincidence, both the éclair and the cheese are around the same price. Now, if I had to choose, which one would I take? I feel the politically correct answer is to say the cheese, but the truth is, I would probably take the éclair. Of course, I've eaten almost 300 days worth of cheese this past year, so I might be forgiven.